Can we invent 'crap flash photography wednesday'? Yesterday was the equinox and the days are getting noticeably short now, which means even more flash photography, which frankly isn't a strong point for my old brick of a camera. I guess it's time to put it out to grass and get myself a newer model while payday is still recent enough for it not to make me worry too much. Anyhow. 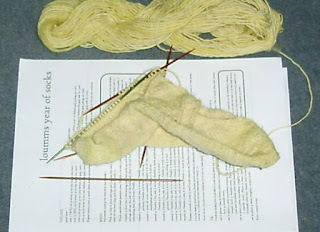 Having abandoned the first ill-fated effort on the Hungry Bees socks (see earlier posts) and started again with some new needles of the right size, the first sock is growing nicely. I'm lovin' these symfonie needles, btw, they feel lovely. I like the positive feel of the metal ones, but the wooden ones are more tactile, natural and friendly. This is quite an exciting time - I've knitted a number of heels using the simple short-row method, and that's worked very well. However, I'm sticking to the pattern a bit more rigidly on this project than I'd normally do (because of earlier problems) and that means taking the plunge and knitting my first heel flap. (See pic!) If you've done it before, you'll know that it's nowhere near as scary as it looks at first. I'm also very happy with the way that the single yarn is knitting. No hint of a bias and no breaks. It's noticeably less even than plied yarn would be, but 1. I'll get better at making it more even and 2. who cares if the finished item has a bit of a 'handmade' look to it? Can't wait to see what it looks like blocked. Knitting those bees and honeycomb will keep the ankle and cuff very interesting to knit. Those socks are comming along well, and i know just what you mean about those needles, they are so good to use, and my crochet hooks have such a lovely feel about them. the bag is comming along a treat . nearly time for a photo.